Thank you all for your sweet wishes on our marriage anniversary!! We are so glad to read all your wishes!! If you’re like me who always buy bulk items and couldn’t consume them soon, you should look at this recipe. It makes good use of leftover breads. If you have any leftover hot dog buns and bored to eat them the same way again and again, turn them into delicious garlic bread. Wondering how? Split open hot dog buns lengthwise. Apply butter on each slice and spread garlic paste on top. Sprinkle black pepper + chat masala and some herbs of your choice. Toast in an oven (I used toaster oven) and enjoy hot, delicious garlic bread with some juice of your choice. These make a quick and perfect breakfast on busy days!! I think I am so quick to comment on this...Nice idea of turning hot dogs to garlic bread...looks yummy..
Oh this is a gud idea..i wanted to make garlic bread and this is very easy..:)thanks 4 sharing!! Garlic bread and soup make for an ultimate combination (we've been having some rainy weather here lately). I also make the garlic bread the same way.Very nice snack to have on a Rainy day like ours over here.So Iam to make some garlic bread today . Yummy garlic bread,lov anything that has garlic flavor.. Cool idea to convert the hot dogs to aromatic garlic breads!! Looks so good. Nice idea! 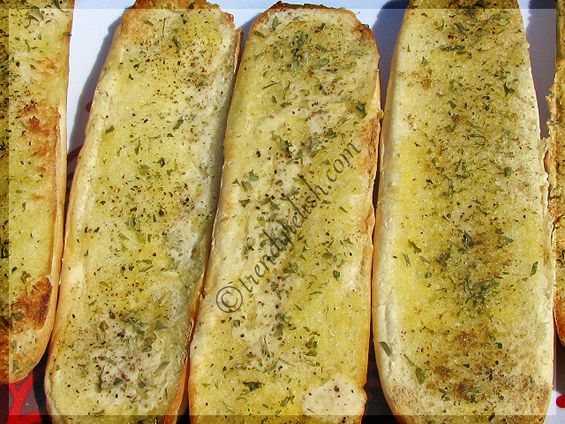 I generally rub the pods over Wheat bread slices and sprinkle dried herbs.. but gotta try this one..
Lovely garlic bread! gr8 way to make use of left over bread! Its looks really yummy and mouth watering. Enjoying this with coffee while sitting in a small back yard garden-what an idea. Do you agree? Yeah I am totally one of those people that you talk about... buying stuff in bulk! I don't know why I do it sometimes, but it forces me to come up with innovatove ideas to use them up. There is some good in it I guess. Looks lovely! Can i grab a piece? Dear Uma, belated wishes for your anniversary, and here's hoping you have many, many, many more! 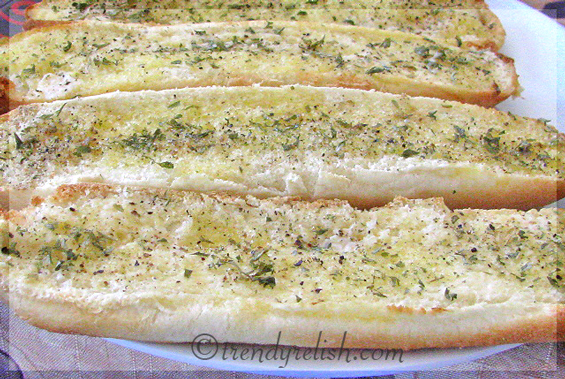 Garlic bread's one of my favorites-- I love garlic in just about anything but with fluffy white bread? Heaven. I love garlic bread..I bet theese home made garlic bread will taste better than a frozen stuff...Adding chat masala is really a kick to the garlic bread.. This would be so much better than any store bought bread..looks delicious. Looks perfect....certainly a very good idea...will try soon...as I love ginger bread. Looks yummy. I love gartlic bread. Just yummy and easy way..Thanks Uma..
the garlic bread looks yummy. I am in India, and recovering frm a horrible stomach flu. I usually prepare garlic bread using baugette. Will try with hot dog sometime, thanks for sharing. I make a similar one and we have it with soup! indeed a quickie..good one uma..
Garlic bread looks so perfect! yummy..! Hot dog buns for garlic bread and chat masala on it oooo mmaaaa u r really great uma what an idea will sure try this for to days dinnet with some soup mmmmmm. Love the idea of making these at home..
looks yummy and simple. Can i tiast in microwave in grill mode. I don't have a oven. ehehe..this is a lovely snack and I make it often for my kiddo with some soup. Looks tempting Uma..